So how big or- how bad- is the gradient? Some comparative evidence may be useful. Making comparisons across countries is somewhat perilous. But I think one can say something with the large datasets available now. 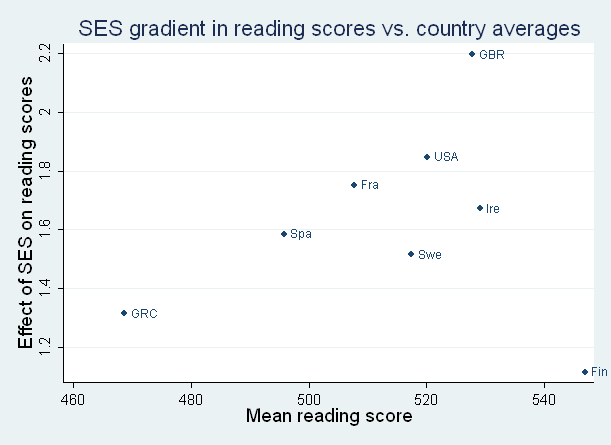 Using PISA I regress the reading score against an index of SES (the ISEI index due to Harry Ganzeboom if you are interested). No other controls are included since they might mop up the effect. 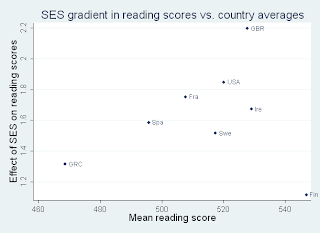 So the regression coefficent gives a scalar measure of the extent to which high SES is associated with high reading scores. One might call it marginal inequality as distinct from conventional measures of inequality which look at variation round the mean. What sort of countries have a high SES gradient? Clearly one could look at many possible characteristics of countries in answering 2. I consider only 1 whether the average score is high. If we find a positive correlation between the gradient then maybe thats saying the high marginal inequality is the price we pay for getting a high average. The results are in the graph below. In terms of marginal inequality, Ireland is about average. Our SES gradient is below the Anglo-Saxon countries (USA, GB) and also France but higher than the Nordics (Finland, Sweden) & Southern Europeans (Greece, Spain). Aside from Finland there is pronounced upwards relationship: countries with a high SES gradient (which is presumably a bad thing) also have a high average score (a good thing). Is it a price worth paying, one might ask? I thought I had contested your main point: it doesn't make sense to measure effects on attending Uni controlling for LC points. Achieved points are an unknown mix of actual educational achievement and intention to attend university. I'm not quarrelling with the idea that SES differences work largely through differences in achievement before university entry, but the reason you get such a clean result is that you are (to a degree) conditioning on the outcome. There is a second argument about social class effects on educational outcomes that should interest you, coming from an argument between Heckman and Robert Mare. This gave the unusual spectacle of an economist berating a sociologist for underestimating the effect of class. Mare showed declining class effects across successive educational transitions, conditional on having got that far (I think in JASA 1980); Heckman pointed out that the successive hurdles are selective, such that members of disadvantaged groups who succeed have increasingly high levels of unobserved characteristics leading to success (Cameron and Heckman, J Polit Econ 1998, if I've found the right reference). Obviously, this unobserved heterogeneity attenuates the effect of observed attributes. Kevin says: "Most commentators ignored this point for reasons that I don't understand." Did my long comment challenging this get lost in the ether? Key point: LC points are an intermediate outcome, so using that to predict going to Uni is (to a degree) conditioning on the outcome. OK, I was just riffing off the first paragraph. Sorry to thread-jack. & thanks for the comments nonetheless, very useful!